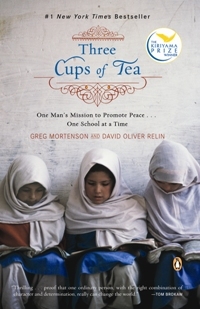 Last night I finished reading Three Cups of Tea by Greg Mortenson and David Oliver Relin. It was one of the most wonderfully inspiring books that I have every read. I challenge anyone to read it and not want to do more for their fellow man. I have met many people in my travels in life and often the view is that not much can be done about various problems on this planet. Or at least not by them. Greg Mortenson shows us how compassion and understanding and actually doing something can actually change the world and make it a better, safer place. Terrorists do not stand a chance in the face of Greg and his team. I thought that the book was incredibly well researched and kudos to David for helping tell Greg’s story so well. Oh, by the way – it was the garlic that made my eyes water at the end of the book – it had nothing to do with the story. Please, please, please read this book. Keep posting. I always enjoy your posts.